The 2019 Buick LaCrosse is definitely a fierce competitor if you’re looking for a 2019 vehicle. This car has a plethora of safety and connectivity features that will have your friends and family green with envy. To get an idea of what you’ll get when you invest in the 2019 Buick LaCrosse, we’ll list some of our favorite features. Admittedly, the features included in the base model are comparable to most of the vehicles that have been released this year. However, what sets the 2019 Buick LaCrosse apart from other vehicles is the fact that it includes many of the best features in a luxurious, yet affordable vehicle. When it comes to purchasing a luxury vehicle, the price can be discouraging at times. However, you won’t find that to be the case with the 2019 Buick LaCrosse, as the starting MSRP is low and affordable. If you’re looking to add on packages and customize, please note that this will increase overall price that you’ll pay. However, the starting MSRP for the 2019 Buick LaCrosse is $29,570, which is affordable and exciting. If you’re ready to commit to a luxurious vehicle without a lavish price tag, you’ll love the 2019 Buick LaCrosse. One of the greatest and most desirable aspects of the 2019 Buick LaCrosse is the fuel economy. This vehicle will keep you on the road longer, which is always a bonus. If you’re looking for a luxurious vehicle that is efficient on gasoline, you’ve found it in the 2019 Buick LaCrosse. You’ll get 25 MPG in the city and 35 MPG on the highway, which is outstanding even by sedan standards. Furthermore, you’ll be able to spend more time on the road between fill-ups due to the fact that it has a 15.8-gallon fuel tank. If you’re ready to commit to a vehicle, it should be one that will be able to withstand all of life’s demands. If you’re ready to enjoy 29 combined MPG, it’s time to check out the 2019 Buick LaCrosse. Lastly, and arguably one of the most important aspects of a vehicle in 2019 is the connectivity features. In 2019, you know that it’s vitally important to be able to seamlessly connect and keep connected while on the road. Life doesn’t stop while you’re driving, let’s stop pretending that it does. If you’re a member of the fast-paced business world, you know how important it is to not miss a beat. That’s why we love the 2019 Buick LaCrosse. The 2019 Buick LaCrosse includes a variety of features that will keep you connected on the road. The 2019 Buick LaCrosse will help to ensure that you’re not missing life simply because you’re behind the wheel. Additionally, you’ll be able to easily navigate to your location in addition to playing the music that’s important to you. Ready to be more connected and drive a vehicle that will help you maintain that connectivity? Get behind the wheel of the 2019 Buick LaCrosse today! The aforementioned features typically come with a vehicle that has a hefty price tag. Although you could pay more for the same features, why would you? Instead, invest in the 2019 Buick LaCrosse, and enjoy all of the features that you’re looking for at a fraction of the price. You’ll be glad that you did. If you’re ready to take your driving experience to the next level without breaking the bank, it’s time to consider the 2019 Buick LaCrosse. And with such a low MSRP there’s plenty of wiggle room to add on even more luxurious features, trims and accessories, if that’s more your style. The 2019 Buick LaCrosse has enough style for anyone but a more creature comforts are rarely a bad thing. When it comes to selecting a vehicle that will fit your needs and your lifestyle, it’s imperative to consider the fuel economy. You’re not going to be completely satisfied with a vehicle that requires constant trips to the gas station due to low fuel efficiency. If you’re ready to spend more time on the road and less time at the pump, it’s time to see what the 2019 Buick LaCrosse can do for you. You’ll love the fact that the 15.8-gallon fuel tank will stay full longer. The 2019 Buick LaCrosse has an impressive fuel economy that gets 25 MPG in the city and 35 MPG on the highway. This means that you’ll be able to spend more time doing the things that matter to you and you’ll spend less time worrying about where you’re going to fill up next. Although fuel economy is typically pretty good on compact vehicles such as the 2019 Buick LaCrosse, that’s not always the case. Sometimes, the fuel economy can be the reason that customers won’t commit to a particular model. Instead of settling for less, aim for the best and purchase the 2019 Buick LaCrosse. You’ll be able to enjoy the peace of mind that accompanies an efficient vehicle that will do even more to save you money. Although some of these features have now become standard in 2019, some are still new and exciting, such as the Buick Connected Services options. With Buick Connected Services, you’ll have access to a plethora of helpful information that will help you be an informed driver. Some of the Connected Access features include vehicle diagnostics, Buick Smart Driver, Marketplace, and Remote Access. The vehicle diagnostics will help you to take control over your drive and take the guesswork out of troubleshooting an issue. With this feature, you’ll receive monthly diagnostics reports, in addition to getting real-time notifications when something more serious happens. If you’re ready to enjoy the connectivity features that the 2019 Buick LaCrosse has to offer, it’s time to contact your local dealership. In the higher trim levels you can become even more connected with your surroundings with active safety features such as auto-dimming rearview mirror, rear cross-traffic alerts, a safety alert seat, lane change alerts with side blind zone alert, forward collision alert, built-in navigation and wireless smartphone charging. What’s not to love? 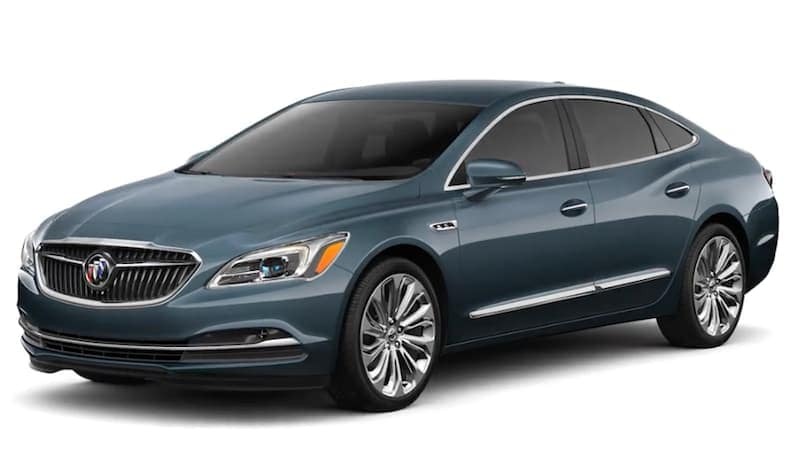 If you’re looking for a place to purchase your 2019 Buick LaCrosse, it’s time to check out Carl Black Kennesaw. As a competitive car dealership in the Kennesaw area we will always exceed your expectations. Whether you’re ready to purchase or you’re going to need some additional information, you’ll find what you need at Carl Black Kennesaw. We have an experienced and knowledgeable staff who are always ready to greet customers with a smile and the information necessary to make an informed decision. If you’re looking for a dealership in the Kennesaw area, chances are that you’ve already shopped around. As you may know, some dealerships will claim that they have excellent customer service, but will not demonstrate that when it comes to making the actual sale. Thankfully, Carl Black Kennesaw is different. We truly care about our customers and it’s evident in our daily interactions and tasks. If you’re ready to shop with a dealership who cares about seeing you get into a safe and reliable vehicle, like the 2019 Buick LaCrosse, it’s time to check out Carl Black Kennesaw. Not only do we provide exemplary customer service, but we also offer the lowest possible prices on the best inventory in the area. Don’t delay, call Carl Black Kennesaw as soon as possible! You’ll be glad that you did.